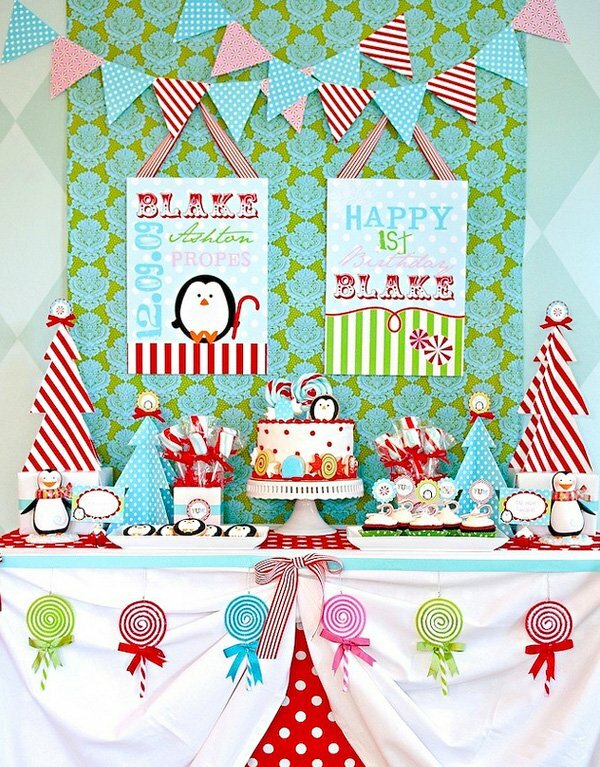 Rebecca from Fresh Chick Design Studio sent in this darling “Winter Candyland” party that she designed & created for her son Blake’s first birthday. Pretty darn cute, right?! Between the bright & festive color palette, clever DIY “Stocking Garland”, TWO buffets of winter-themed sweets (with treats like mitten-shaped sugar cookies & peppermint candy-topped cupcakes! 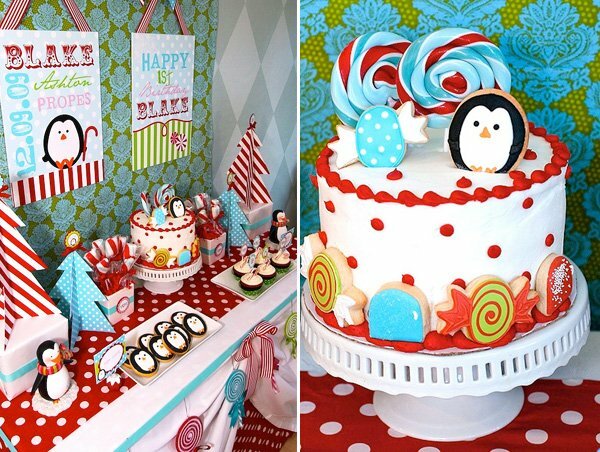 ), and those adorable little penguins, I’d say this is a very HAPPY-looking birthday party, indeed! 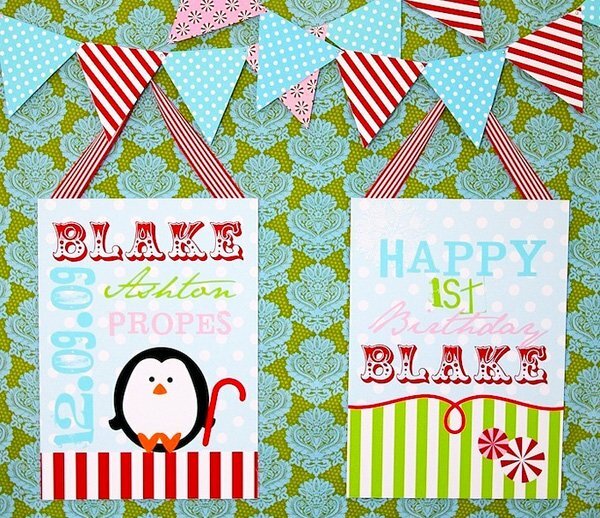 “The party was put together for my younger son Blake, who turned one on December 9th. The theme was a “Winter Candyland”. I started with a color palette of red & aqua, but added a few accent colors so that the theme could work for both boys and girls. 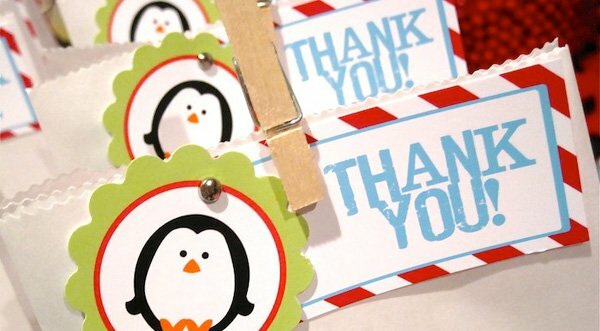 I created this cute penguin graphic to add some wintery detail and incorporated lots of candy to bring in the whimsy factor. I wanted it to be festive for the season, without being over the top “holiday”. 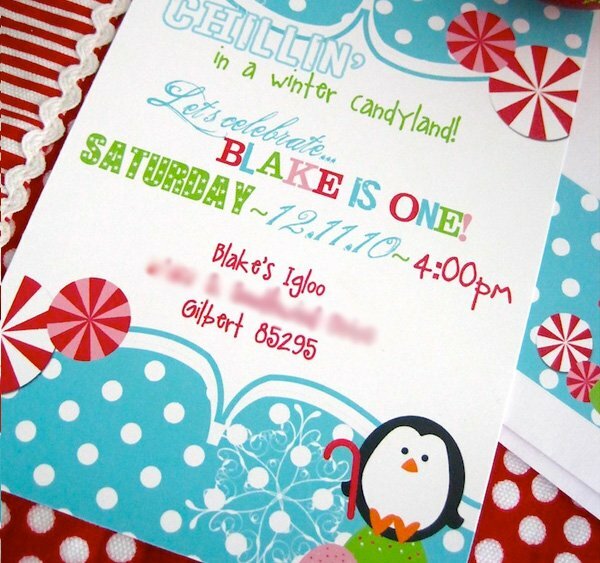 I designed all of the printables for the party along with much of the decor. My first project was to create “birthday posters” as the building block for the desert table. I printed up 13×19 posters that were mounted on foam board and hung from candy cane stripe ribbon. The posters were layered on top of an aqua and lime damask fabric, and a paper flag banner hung above them (made using the digital papers I created). The dessert table was flanked with paper trees made from the same digital papers as the banner. (I was inspired to make these paper trees by my sweet feathered friend of Bird Crafts!) I also made lollipop bouquets to add height and interest to the table. The center focus of the table was definitely the cake. I ordered a cake from Target but made some special requests to accommodate a few ideas I had. They offer a standard 8” round double layer cake…I asked for them for a third layer, fudge between the layers, and smooth buttercream icing with red polka dots and a red beaded border. I would take care of embellishing the rest. The cake decorating was totally last-minute, using a few items I had for the party: a couple large swirly lollipops and some of the super-cute decorated cookies from The Cookie Jar. I kept the treats on this table fairly simple since there were lots of colors and patterns going on already. The only other items here were decadent red velvet cupcakes and the adorable custom sugar cookies (also pictured at top, in image #2). 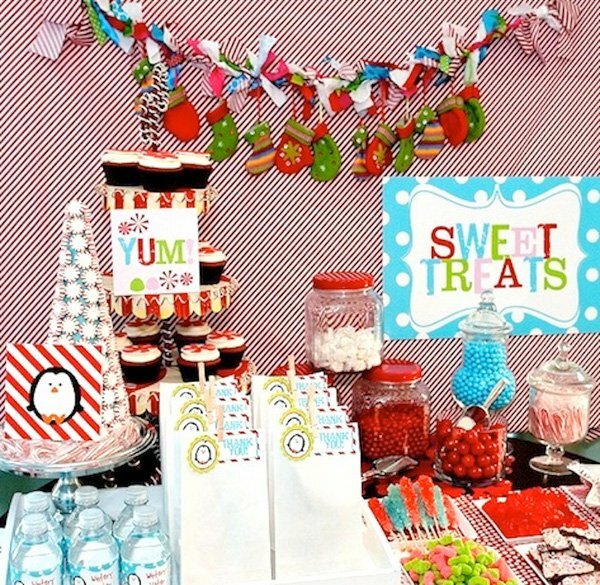 Since I was limited with space on the dessert table, I added a separate candy bar loaded up with all sorts of sweets. 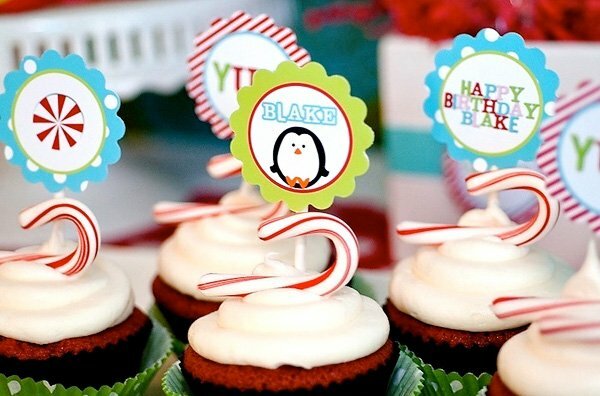 To carry the theme over, more custom signs adorned the table, along with treat bags, fondant-topped cupcakes, colorful fabric, and a cute DIY stocking garland. For entertainment all of the kids had a blast taking turns hitting the penguin pinata. All of the pint-sized guest were sent home with candy bags, penguin drink cups, and a fun ornament to hang on their tree! CUTENESS OVERLOAD!!! I just love all the bright colors too! I love the theme so cute. I would love to know where you found the penguin cups! Wow!!!! great job! Its soo beautiful – it def, has the winter wonderland feel :) love it! 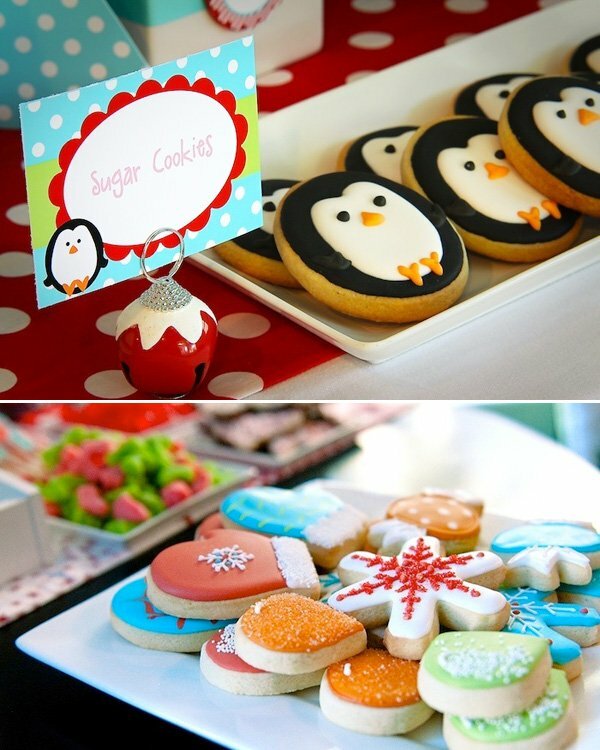 What a cute and brightly colored party idea! I love that it’s great for boys or girls all winter long!! Great job! The glitter trees were actually a little DIY project I did that I found on another site (: Just take foam cones, spray adhesive and glitter…set on top of a candle holder and tah-dah!! This is so darn cute!! I love the ideas and the colors. Absolutely adorable!! Your eye for party design is beyond amazing! The colors and designs that you used were a feast for the eye. Blake is one lucky little boy :) Thank you for including my cookies in your celebration. It was so exciting to create for you and the pictures that were taken are gorgeous! Please thank the appropriate photog. for their visions! What a cute and unique theme. I love the color combination and all the prinatables too.. Great job on a fun and colorful party!! What a great winter birthday idea! My younger son’s birthday is Dec. 10, so anything I do competes with the Christmas decorations. This year, as he is my last to turn two, I did a Cat in the Hat party for Thing Two. 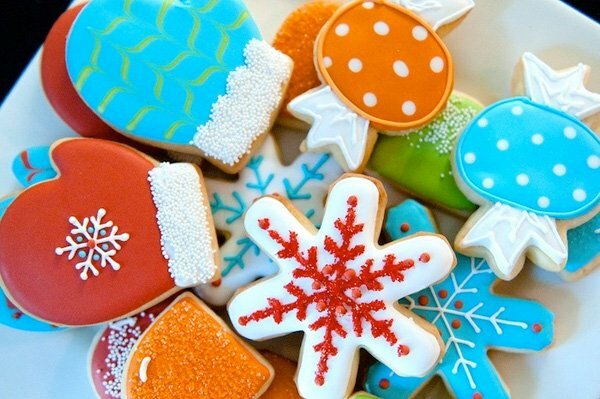 Red, turquoise and white decorations and food and – bonus! – it all can be incorporated into our holiday decorations. 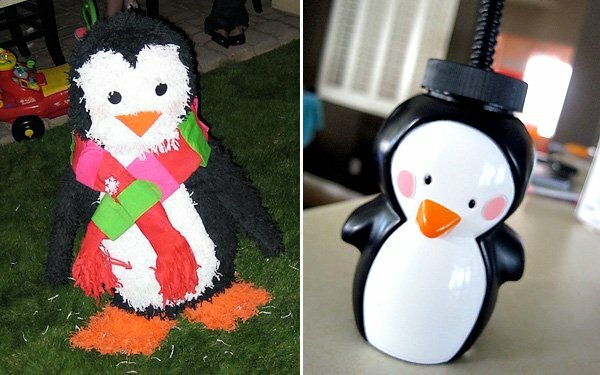 I must admit, I may head to Target for those adorable cups and save them for a Penguin Party next year. OMG…so cute!!!! My little one LOVES penguins…where did you find the penguin drinking cups? Wow, everything you did was fabulous. And the best part is it looked like your son had a great time! I love the way you spiced up such a simple cake from target to make it fabulous! Thanks for sharing all of your wonderful ideas. What a great theme. Everything looked so good. So professional. Fabulous. 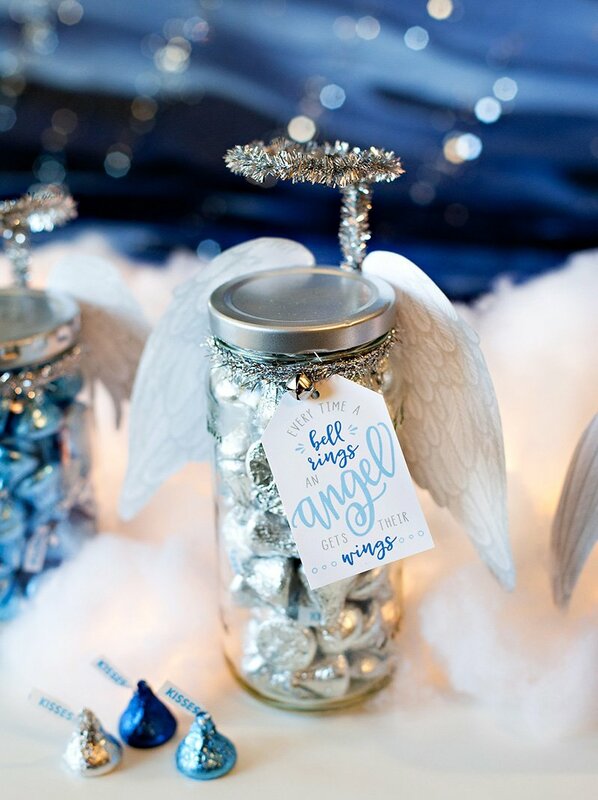 What a gorgeous and genuis winter party idea! My daughter’s birthday is December 30th & I usually host a party after the holidays, but still have a hard time getting all the Christmas decor down before her party. I so LOVE this. This year we are having a Princess Party (this Saturday-yay!) but I am very interested in looking into this theme for next year. Would you be willing to recreate some of your decorations in a custom order? You are so creative! Thanks for sharing your talents & happy new year! This reminds me so much of my niece’s 1st birthday party that was the same day in the same zip code. From the penguins to the colors, it’s so similar it’s crazy! What fabulous decorations! Thanks for the inspiration. I am currently planning a similar “Winter Wonderland” 1st birthday for my daughter. I will absolutely use some of your great suggestions. Do you mind me asking what you included in your thank you bags as gifts for the guests? Great theme!!! You mention the cake was from Target. I’m assumming your target has a bakery. Correct??? You are so creative. I love the party theme. Can you please tell me where you got the lollipop decorations hanging from the table? I want to have a candyland theme for christmas. I love all the DIY ideas on your site. I live in japan and we are very limited on decorations here. 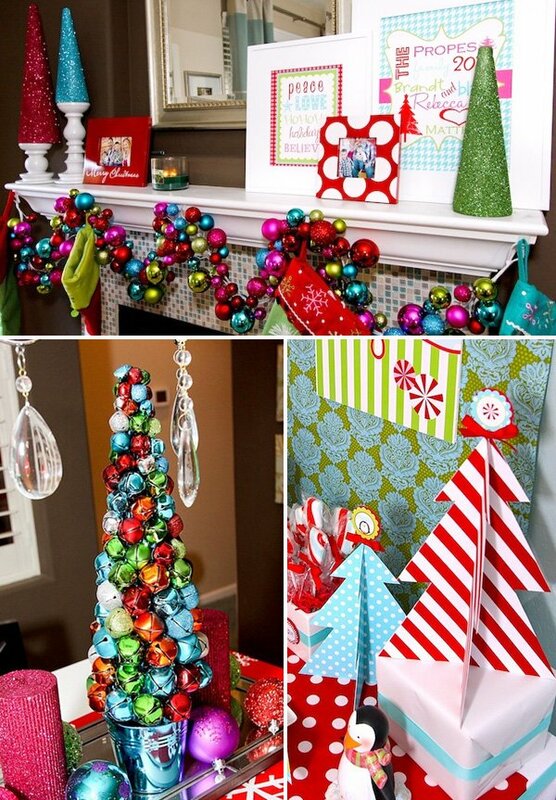 Can you please tell me how you made or where you purchased the ornament garland that is hanging on the mantle? Thanks! Soo creative! I adored your b-day theme! It’s prefect for my son! Who’s actually turning 1 this coming december,he’s birthday is on the 25th! Christmas baby! ;) I was wondering if you could please send me the direct links of where your found the poster’s, cupcake toppers, etc. I would really appreciate it! thank you! LOVE the theme! What a wonderful idea… I was looking for inspiration for my son’s birthday and you just blew me away! Funny thing is that our little ones share the same birthday (Dec. 9) and my husband’s name is Blake. Coincidence or what?! Thanks for posting it… I will be in touch to pick your brain and order a few things soon! 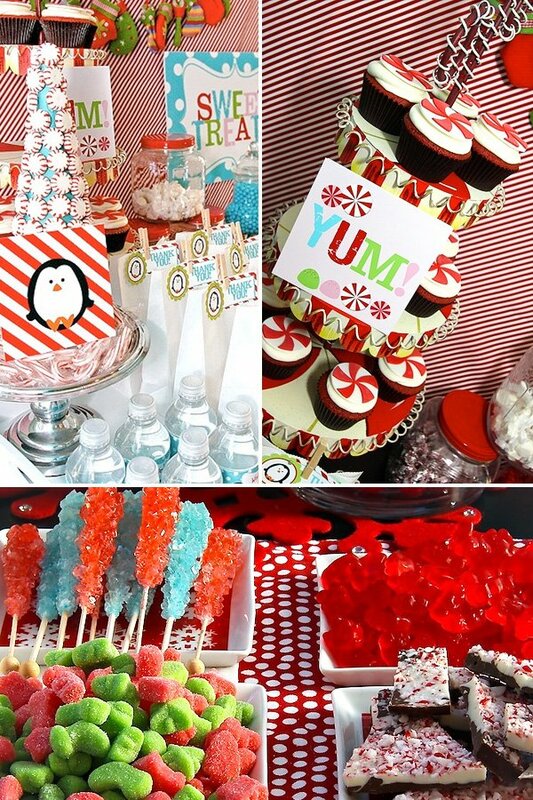 Thanks Fresh Chick Design Studio for sharing awesome theme “Winter Candyland” for kids party. I want to order this theme for my kid’s birthday. Love, Love this idea. My daughter is turning one in December and I would like to purchase all of the printables – how do I do this? I have just found this website and I love your birthday party theme. I love the penguin statues, can you tell me where you found those? I love the aqua and lime damask fabric! Could you let me know where you found it? I love the ornament garland. How did u get the bulbs to stay together on the string? Natalia Venturelli… olha que fofo! I want this theme for my son first birthday he was born on Christmas. Where can I buy this?? 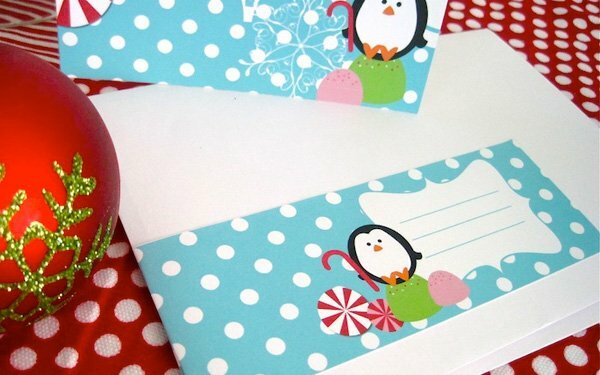 Can you tell me how you made your darling scrapbook paper trees? They look sturdy! 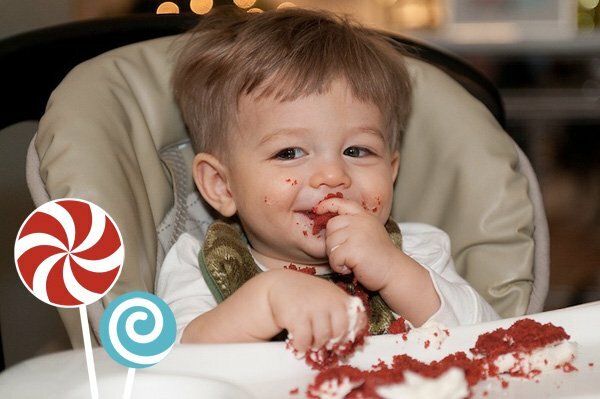 I love this and hope to do this for my son’s first birthday Dec 6. Is there a way I can have pricing for the posters and invitation? ?